Alaska Air Group’s strong financial performance in 1Q2014 was largely overshadowed by the competitive issue that has dogged the company throughout the last year – how Delta’s abandonment of Alaska and the mammoth carrier’s build-up in Seattle will ultimately affect Alaska. Beyond acknowledging that the capacity Delta is introducing in Seattle is challenging, and laying out a detailed plan to combat some of the oversupply, there is little Alaska can do to shine a light on exactly how the new dynamics at its largest base and headquarters will ultimately affect its fortunes. If the supply-demand scenario remains unbalanced on certain routes from Seattle over a long period of time, then something will have to change. At that point it will be interesting to see if Delta with all its scale and might pulls back, or if Alaska is forced to re-think how it utilises its most important hub. After Delta detailed a raft of new service in Alaska’s top markets to feed the major carrier’s growing long-haul markets from Seattle (Delta is building its trans-Pacific presence in Seattle), Alaska explained the effects of Delta’s aggressive expansion. By YE2014 Delta and Alaska will overlap in 13 city pairs from Seattle, and Delta’s seat share in Seattle will equal Southwest and United combined, Alaska explained. 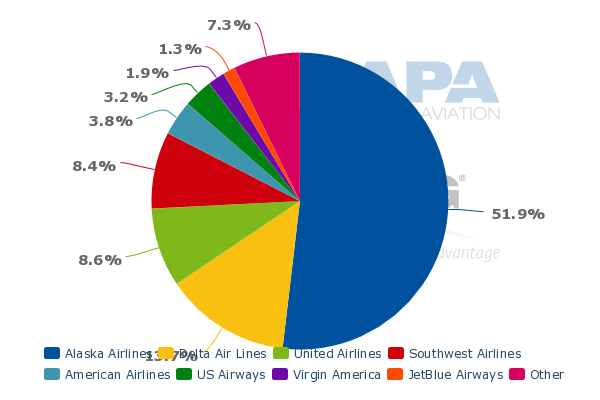 CAPA and OAG data for 28-Apr-2014 to 4-May-2014 show that Delta currently has a nearly 14% seat share while the combined share of Southwest and United is 17%. As Alaska waits for the supply-demand balance to correct in some of those markets, the airline is playing defence. Two major pillars of its strategy are reallocating capacity within and outside Seattle. During 2014 Alaska is introducing service from Seattle to Tampa, Detroit, New Orleans, Albuquerque, Baltimore and Cancun. Delta only serves one of those markets, its Detroit hub. Alaska is competing with Southwest on the new service to Albuquerque and Baltimore and operating alone in the Tampa and Cancun markets. Alaska is also building up its presence in Salt Lake City (one of Delta’s smaller hubs) after inaugurating service between Seattle and Salt Lake City in 2013. Beginning in Jun-2014 Alaska is launching flights between Salt Lake City and Portland, San Diego, Los Angeles, Boise, San Jose, Las Vegas and San Francisco. Delta serves all of those markets, and Southwest also operates service to Portland and Los Angeles. But with Alaska’s strong presence in Seattle, it can possibly leverage its brand and presumably ample flyer base to achieve success on the new routes from Salt Lake City. Previously, Alaska has concluded that Seattle-Salt Lake was performing quite well, and the carrier saw an opportunity to expand in Salt Lake City. The numbers are stark. 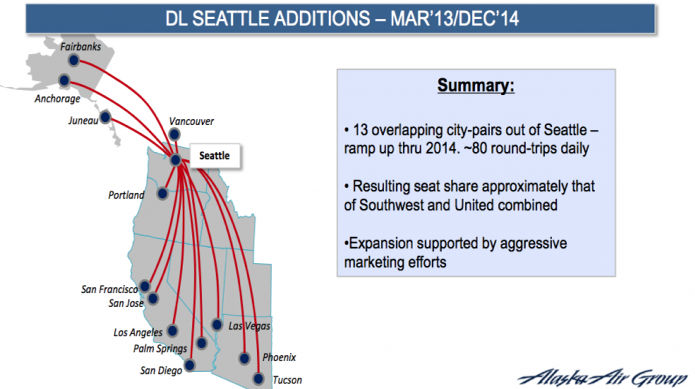 CAPA and OAG data show that between 28-Apr-2014 and 2-Jun-2014 the number of weekly seats Delta is deploying from Seattle are rising from approximately 105,224 to 150,720, a rise of roughly 43%. Alaska did admit that generally speaking, its unit revenues are under pressure in the markets where it is experiencing increased competitive capacity. Additionally, and not surprisingly, Delta is removing its code from Alaska’s flights in a number of markets where the carriers compete with one another. By YE2014 Delta plans to remove its code on Alaska’s flights from Seattle to Las Vegas, Los Angeles, San Diego, San Francisco, San Jose, Vancouver, Anchorage, Houston and Phoenix. 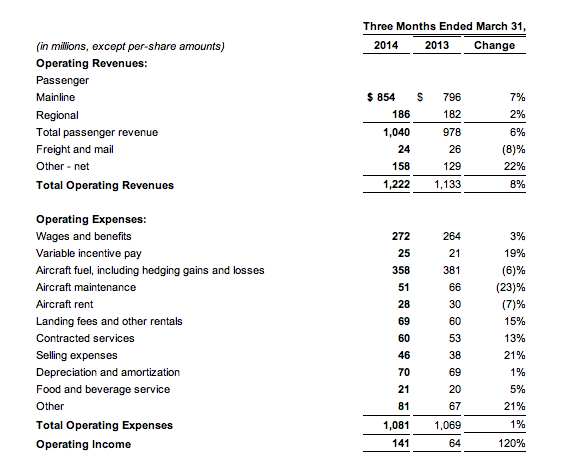 Obviously that means less codesharing revenue for Alaska from Delta. Presently, Alaska nets roughly USD235 million from its Delta codeshare, and estimated in 1Q2014 that number declined about 5% year-on-year. However, Alaska stated it was making up for some lost revenue from Delta through other codeshare pacts, particularly with American. During 1Q2014 Alaska estimated revenues from its relationship with American grew 20% year-on-year. In late 2013 Alaska estimated it netted approximately USD165 million in annual revenue from its codesharing relationship with American. In addition to growing its profits excluding special items by USD45 million during 1Q2014, Alaska increased its top-line revenues by 8% to USD1.2 billion while operating expenses increased just 1% to USD1.2 billion, resulting in a 120% rise in operating income to USD141 million. 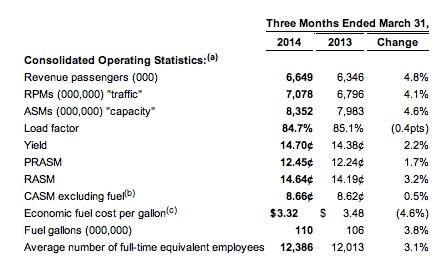 Alaska Air Group’s unit revenues increased 1.7% year-on-year in 1Q2014 despite a 7% rise in competitive capacity in its markets. Its unit costs excluding fuel grew just 0.5% versus previous projections of a 5% rise as IT project costs slipped into later quarters and a tentative flight attendant deal was not ratified. Overall Alaska expects its unit costs excluding fuel to remain flat year-on-year in 2014, which also provides some competitive shield against Delta’s aggressive moves in Seattle. Looking ahead Alaska sees positive momentum in bookings for the US spring 2014, but also warns of increased pressure on its unit revenues due to the increased capacity in some of its key markets. Alaska achieved a healthy 14.8% return on invested capital for the 12M ending 31-Mar-2014, and posted a 32% debt-to-capitalisation ratio, a 3% decrease from YE2013. Its lower leverage, solid revenue and cost performance should be acknowledged even as Delta’s huge threat in Seattle remains a significant overhang for Alaska. Alaska has obviously faced competitive pressure in the past, but the menace that Delta is becoming in Seattle is a viable threat, and the total effects on Alaska remain unknown. Alaska’s options may seem limited as there is only so much dodging of Delta Alaska can perform in Seattle. Without predicting the outcome of Delta’s aggression, Alaska can only craft a response that it concludes will offset some the capacity pressure and generate revenue at the same time. Alaska seems to be prepared for a much reduced relationship with Delta – or even the likelihood that their partnership will dissolve. Unfortunately as Delta unrelentingly builds up Seattle, Alaska continues to find itself on the defensive, looking for ways to deflect the mighty menace that seemingly has no plans to shrink its fast-growing presence in Alaska’s most important market. But finding new friends will inevitably be high on Alaska's agenda. A resurgent American is one friendly face, but Delta's vacuum will take more filling in the short term.